Background and objectives Our study explored the association of histopathologic classification of ANCA-associated GN with renal survival in Chinese patients with myeloperoxidase-ANCA–associated GN. Design, setting, participants, & measurements Two hundred fifteen patients with biopsy-proven myeloperoxidase-ANCA–associated GN were included from January of 1996 to December of 2014. The biopsies included focal (n=27), mixed (n=82), crescentic (n=47), and sclerotic (n=59) classes. The long-term renal outcome and risk factors of myeloperoxidase-ANCA–associated GN for different histopathologic classes were retrospectively analyzed. Results During a median follow-up time of 22 (9–51) months, 88 (40.9%) patients reached ESRD. The 5-year renal survival (overall 58.7%) was highest in the focal class (100.0%) and lowest in the sclerotic class (20.7%), with no difference between the mixed (58.9%) and crescentic (67.4%) classes. Patients in the mixed (hazard ratio, 0.34; 95% confidence interval, 0.20 to 0.57; P<0.001) and crescentic (hazard ratio, 0.31; 95% confidence interval, 0.16 to 0.59; P<0.001) classes were at lower risk for ESRD compared with patients in the sclerotic class, as were patients who received glucocorticoids plus mycophenolate mofetil (hazard ratio, 0.32; 95% confidence interval, 0.18 to 0.60; P<0.001) compared with those receiving glucocorticoids alone. In addition, patients with a serum creatinine level ≥4 mg/dl (hazard ratio, 2.93; 95% confidence interval, 1.77 to 4.85; P<0.001) or hypoalbuminemia (hazard ratio, 2.11; 95% confidence interval, 1.32 to 3.34; P=0.002) were at higher risk for ESRD. A serum creatinine level ≥4 mg/dl and a percentage of global sclerotic glomeruli ≥60% were the two independent risk factors for ESRD in the sclerotic class. Conclusions The histopathologic classification of ANCA-associated GN in combination with serum creatinine and serum albumin levels and treatment regimen is associated with renal outcome in myeloperoxidase-ANCA–associated GN. The evaluation of serum creatinine level and percentage of global sclerotic glomeruli provides additional information on the risk of renal survival in the sclerotic class of myeloperoxidase-ANCA–associated GN. Since 2010, several studies have confirmed that the histologic classification of ANCA-associated GN (AAGN; AAGN classification) is of prognostic value for renal outcomes (1–13) (Table 1). Most of the patients in these validation studies had proteinase 3 (PR3)-ANCA–associated granulomatosis with polyangiitis (GPA); however, the majority of patients with ANCA-associated vasculitis (AAV) in China and other Asian countries have myeloperoxidase (MPO)-ANCA–associated microscopic polyangiitis (MPA) (14,15). Differences between MPO-AAV and PR3-AAV have been recently reported regarding epidemiology, etiology, pathogenesis, clinical manifestation, prognosis, and especially, genetic features (16); therefore, some investigators have advocated classifying AAV as MPO-AAV and PR3-AAV (15). In China and other Asian countries, GPA is mostly MPO-ANCA positive. However, it remains unclear whether the AAGN classification applies to MPO-AAGN. Moreover, the sample sizes of patients with sclerotic AAGN in previously published studies are small; this sclerotic class is defined as ≥50% global sclerotic glomeruli, resulting in significant differences in the proportion of global sclerotic glomeruli among different patients and thus, differences in prognosis. Therefore, to evaluate the prognostic value of the AAGN classification, this study retrospectively analyzed the long-term renal prognosis and prognostic factors of 215 Chinese patients with MPO-AAGN for different histopathologic classes and analyzed the risk factors influencing the prognosis of patients of the sclerotic class. Two hundred fifteen patients with MPO-AAGN diagnosed at the National Clinical Research Center of Kidney Diseases, Nanjing Jinling Hospital, Nanjing University School of Medicine from January of 1996 to December of 2014 were retrospectively reviewed. All patients fulfilled the following criteria: (1) met the Chapel Hill diagnostic criteria (17), (2) were identified as ANCA positive by both indirect immunofluorescence assay and ELISA, (3) had renal involvement and a renal biopsy specimen containing ≥10 glomeruli under light microscopy, and (4) had a follow-up time ≥6 months or reached ESRD within 6 months. Patients with any of the following conditions were excluded: (1) secondary vasculitis such as Henoch–Schonlein purpura, drug allergies, drug-associated (hydralazine, propylthiouracil, minocycline, and levamisole-adulterated cocaine) AAGN, lupus vasculitis, rheumatoid vasculitis, tumor, cryoglobulinemia, and infection; (2) comorbid kidney diseases, such as IgA nephropathy, diabetic nephropathy, membranous nephropathy, and antiglomerular basement membrane nephritis; and (3) Hepatitis B virus, Hepatitis C virus, or HIV infection. This study was approved by the Institutional Review Board of Jinling Hospital, Nanjing University School of Medicine. The renal biopsy specimens were examined with light microscopy, immunofluorescence, and electron microscopy according to standard procedures. As described by Berden et al. (1), the renal histopathology was classified as focal (≥50% normal glomeruli), crescentic (≥50% glomeruli with cellular crescents), mixed (<50% normal, <50% crescentic, and <50% global sclerotic glomeruli), or sclerotic (≥50% global sclerotic glomeruli). Chronic renal tubulointerstitial lesions, including renal tubular atrophy and interstitial fibrosis, were scored semiquantitatively and described as mild (score of one) for <25% renal tubulointerstitial involvement, moderate (score of two) for 25% to 50% involvement, and severe (score of three) for >50% involvement. All of the renal biopsies were read independently by two experienced renal pathologists who were blinded to the clinical data. Inconsistencies in glomerular classification were resolved by discussion and consensus. The interobserver variation in histopathologic classification was tested (κ=0.90). The baseline renal measurements from within 2 weeks before renal biopsy were collected and included urine red blood cell count, urinary protein, serum creatinine (SCr), eGFR (using the Chronic Kidney Disease Epidemiology Collaboration equation), plasma albumin, and ANCA (indirect immunofluorescence assay and ELISA). Renal disease is defined as the presence of hematuria with or without the elevation of SCr and proteinuria. Vasculitis activity was assessed with the Birmingham vasculitis activity score method (18). During induction therapy, patients with severe renal damage or pulmonary hemorrhage received intravenous methylprednisolone (500 mg/d for 3–6 days) pulse therapy and additional immunoadsorption (IA; before the year 2010) (19) or double-filtration plasmapheresis (DFPP; as of 2010) (20) followed by glucocorticoids alone, glucocorticoids plus mycophenolate mofetil (MMF), or intravenous cyclophosphamide pulse therapy (IV-CTX) as previously reported (21). Maintenance therapy included glucocorticoids plus azathioprine or MMF. The patients were followed up until death, progression to ESRD, or the final follow-up date (December 31, 2015). ESRD was defined as eGFR<15 ml/min per 1.73 m2 or requiring RRT for >3 months (9). The data are presented as mean±SD, median (interquartile range), or percentage. One-way ANOVA was used to compare normally distributed continuous data followed by the least significant difference test if equal variances were assumed or the Tamhane T2 test otherwise (on the basis of the homogeneity of variance test) for additional pairwise comparisons between different classes. The Kruskal–Wallis H test was used to compare non-normally distributed continuous data. Categorical data were compared using the chi-squared test. Kaplan–Meier survival analysis was used to estimate patient and renal survival, and the log rank test was used to compare the difference between the survival curves. Univariate and multivariate analyses of survival were performed by Cox regression. The results were expressed as hazard ratios (HRs) with 95% confidence intervals (95% CIs). Model 1 was the unadjusted model and included the baseline clinical parameters and treatment regimen, which were assessed as potential confounding factors of renal histologic class in influencing ESRD. Model 2 was adjusted for baseline clinical parameters, renal histologic class, and chronic tubulointerstitial lesion. Model 3 was adjusted for covariates from model 2 and treatment regimen. SPSS software (version 20.0; IBM SPSS Inc., Chicago, IL) was implemented for statistical analysis. P<0.05 was considered statistically significant. Among the 215 patients with MPO-AAGN, 84 were men, and 131 were women; median age was 52 years old (37–59 years old), and median Birmingham vasculitis activity score was 14 (12–15). The SCr was 3.8 mg/dl (2.0–6.3 mg/dl) at baseline, and 195 (90.7%) patients had renal insufficiency; 73 (34%) of the patients required initial RRT (Table 1). Induction treatment included glucocorticoids plus either MMF (n=85) or IV-CTX (n=84) or glucocorticoids alone (n=46). One hundred sixty-nine patients were given methylprednisolone pulse therapy; 52 patients also received additional IA or DFPP. Twenty-seven (12.6%) patients were classified as the focal class, 82 (38.1%) patients were classified as mixed class, 47 (21.9%) patients were classified as crescentic class, and 59 (27.4%) patients were classified as sclerotic class. There was a significant difference in the manifestation of renal damage among the four classes (Table 2). Renal insufficiency was severe in the crescentic and sclerotic classes, with the proportion of gross hematuria (55.3%) and the urine red blood cell count being highest in the crescentic class. The focal class had a significantly lower urinary protein level compared with those of the other classes (Table 2). The score of chronic renal tubulointerstitial lesions was significantly higher in the sclerotic class than in the other classes (P<0.001) (Table 3). Of the 73 patients who required initial RRT, 29 (39.7%) discontinued RRT within a median time of 1 month (0.5–1 month); the remaining 44 patients remained on RRT. The proportion of patients who discontinued RRT was highest in the focal class (two of two; 100%) followed by those in the mixed (12 of 20; 60%), crescentic (11 of 19; 57.9%), and sclerotic (four of 32; 12.5%) classes. During the follow-up of 215 patients with a median time of 22 months (9–51 months), 88 (40.9%) patients progressed to ESRD, among whom 61 (69.3%) patients progressed to ESRD within 1 year. All patients in the focal class showed renal survival. The patients in the sclerotic class (46 of 59; 78.0%) had the highest incidence of ESRD followed by those in the mixed (29 of 82; 35.4%) and crescentic (13 of 47; 27.7%) classes. The overall 5-year renal survival rate was 58.7%. The 5-year renal survival rate was significantly higher in the focal class (100%) than in the mixed (58.9%; P=0.001), crescentic (67.4%; P=0.003), and sclerotic (20.7%; P<0.001) classes, and it was significantly lower in the sclerotic class than in the other three classes (P<0.001). There was no difference in the renal survival rate between the mixed and crescentic classes (P=0.69) (Figure 1A). Renal survival rates of myeloperoxidase-ANCA–associated GN in different risk factors. (A) histopathologic class, (B) serum creatinine (SCr) level, (C) serum albumin (S-Alb) level, and (D) treatment regimen. GC, glucocorticoid; IV-CTX, intravenous cyclophosphamide pulse therapy; MMF, mycophenolate mofetil. No patients in the focal class progressed to ESRD. The univariate Cox regression analyses revealed that renal histologic class was correlated with renal survival (Table 4, model 1). After additional adjustment for baseline clinical parameters and chronic tubulointerstitial lesions, the multivariate Cox regression analysis revealed that the risk of renal histologic class for ESRD did not change (Table 4, model 2). After also adjusting for treatment regimen, patients in the mixed (HR, 0.34; 95% CI, 0.20 to 0.57; P<0.001) and crescentic (HR, 0.31; 95% CI, 0.16 to 0.59; P<0.001) classes were at lower risk for ESRD compared with patients in the sclerotic class, as were patients who received glucocorticoids plus MMF compared with those who received glucocorticoids alone. SCr level and hypoalbuminemia were associated with a higher risk for ESRD (Table 4, model 3). The renal survival curves for the different histopathologic classes, SCr levels, albumin levels, and treatment regimens are shown in Figure 1. The multivariate Cox regression analysis revealed that an SCr level ≥4 mg/dl (HR, 4.39; 95% CI, 1.94 to 9.95; P<0.001) and a percentage of global sclerotic glomeruli ≥60% (HR, 2.20; 95% CI, 1.04 to 4.68; P=0.04) significantly associated with a higher risk of ESRD. During follow-up, 20 (9.3%) patients died, and the 5-year survival rate was 87.8%. The 5-year survival rates for the focal, mixed, crescentic, and sclerotic classes were 96.3%, 84.5%, 87.6%, and 90.2%, respectively (P=0.63). MPO-AAGN is common in China, Japan, and other Asian countries as well as in southern Europe (14,15). Validation studies of the AAGN classification in relation to renal prognosis from China (2) and Japan (5,6) have included mainly patients with MPO-AAGN but also, patients with PR3-AAGN or patients with GPA (2,6). In a study from China, 40.5% of patients were diagnosed with GPA (2). In a study of MPA from Japan, 87% patients were MPO-ANCA positive (6). However, the above-mentioned studies did not address the relationship between AAGN classification and the renal prognosis of patients with MPO-AAGN. In this study, we investigated the association of AAGN classification with renal survival in MPO-AAGN in a single-center cohort of Chinese patients that had a large sample size. We found that the renal survival was highest in the focal class and lowest in the sclerotic class, with the crescentic and mixed classes showing intermediate values. These results suggest that the AAGN classification is associated with the renal prognosis of MPO-AAGN. In this study, the proportion of patients in the sclerotic class was higher than previously reported (Table 1), and the median global sclerotic glomeruli percentage was 33%. These findings suggest more chronic glomerular lesions in this MPO-AAGN cohort relative to in other studied cohorts. There are several potential reasons for this extent of severe chronic renal injury. First, all of the biopsies were from patients with MPO-AAGN. It has been reported that the proportions of sclerotic and mixed classes in MPO-AAGN are higher than those in PR3-AAGN (7). In addition, other studies have found a lower proportion of normal glomeruli and higher proportions of fibrous crescents, glomerular sclerosis, and interstitial fibrosis in MPO-AAGN than in PR3-AAGN (15,22). Second, most of the patients with AAGN in our center, including those with advanced renal failure, underwent renal biopsy to determine renal activity and reversibility provided that there were no contraindications for renal biopsy. Third, delayed referral might be associated with advanced chronic renal injury. In addition, one third of the patients required initial RRT and had high baseline SCr levels (median SCr =3.8 mg/dl). The multivariate Cox regression analysis revealed that, among the four classes, the sclerotic class had the highest risk for ESRD and that an SCr level ≥4 mg/dl was associated with higher risk for ESRD by nearly threefold. All of these factors may have accounted for the large percentage (40.9%) of patients who progressed to ESRD in this study and the lower renal survival relative to other published cohorts (1,2,4,5,9–12). In this study and previous studies, among the AAGN classes, the focal class had the highest renal survival and the lowest risk for ESRD, and the sclerotic class had the highest risk for ESRD. In this study, no patient in the focal class progressed to ESRD; in studies by Chang et al. (2) and Ford et al. (9), the HRs for the focal class were reported to be 0.10 (95% CI, 0.02 to 0.51) and 0.17 (95% CI, 0.05 to 0.54) compared with those in the sclerotic class. Slightly conflicting outcomes and risks for ESRD have been reported with respect to the crescentic and mixed classes of AAGN (23,24). One study found that crescentic AAGN had a higher risk for ESRD than mixed AAGN, whereas Berden et al. (1) and Iwakiri et al. (4) found that the renal outcome of the crescentic class was better than that of the mixed class. In this study, we showed that the renal outcome of the mixed class was similar to that of the crescentic class, which is consistent with the results in the works by Hilhorst et al. (3) and Quintana et al. (7). In addition, even after adjustment for baseline clinical parameters and treatment regimen, no difference in the risk for ESRD was observed between crescentic and mixed AAGN in this study, with HRs of 0.31 (95% CI, 0.16 to 0.59) and 0.34 (95% CI, 0.20 to 0.57), respectively, which is consistent with two previous studies (2,9). This finding might be due to the lack of a significant difference between these two classes in the proportion of patients requiring initial RRT, SCr level, the proportion of normal glomeruli, and treatment options. The differences among these validation studies regarding the outcomes and risks for ESRD in the crescentic and mixed classes might be, in part, attributed to the differences in the proportions of normal glomeruli, crescents, and glomerular sclerosis in patients with crescentic or mixed AAGN. The AAGN classification defines the cellular crescent as a proportion of cellular composition in the crescent >10%, with no consideration of the size of the crescent. Therefore, the cellular composition varies widely among different AAGN classification validation studies. Furthermore, the size of the crescent also varies with circumferential and segmental crescents. Variations in crescent composition and size also affect the treatment response of the crescentic class of AAGN, thereby influencing renal outcome. Unlu et al. (11) showed that patients with AAGN with circumferential crescents had a 2.6-fold higher risk of ESRD. 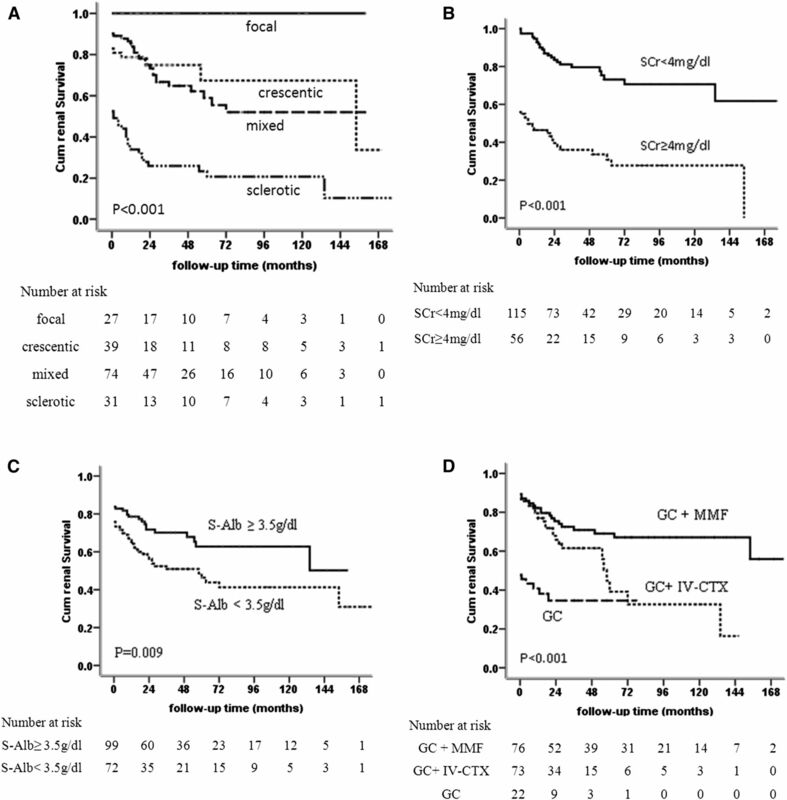 The renal survival of crescentic MPO-AAGN in this study is worse than that reported by previous studies (72%–86%) (1,4–6), likely due to the relatively poor renal function of the patients at baseline (40% patients requiring initial RRT), the relatively increased severity of chronic lesions (high proportion of sclerotic glomeruli), the high proportion of fibrocellular crescents, and the low proportion of patients accepting plasma exchange (24%). Although the receiving of IA/DFPP treatment did not influence renal survival in this study, very few patients received IA/DFPP, which might have influenced the result. The Randomized Trial of Plasma Exchange or High Dose MethylPrednisolone as Adjunctive Therapy for Severe Renal Vasculitis (MEPEX) Study showed that, in patients with AAV with SCr>500 μmol/L, plasma exchange increased the proportion of patients able to discontinue dialysis (25). We found that 20.7% patients with sclerotic MPO-AAGN had renal survival at the fifth year and that some of these patients were able to discontinue dialysis. In previous studies, the 5-year renal survival rate of sclerotic AAGN has been reported to be as high as 50%–70% (1,5), and in the study by Moroni et al. (12), the renal survival rate of the sclerotic classes exceeded that of the crescentic class. The definition of the sclerotic class is a proportion of global sclerotic glomeruli ≥50%, resulting in variation in the extent of glomerular sclerosis and baseline renal function among different cohorts. In this study, for the first time, we investigated the risk factors influencing the renal prognosis of sclerotic MPO-AAGN and found that an SCr level ≥4 mg/dl and a global sclerotic glomeruli proportion ≥60% were associated with a significantly higher risk for ESRD. Therefore, the evaluation of the renal prognosis of sclerotic MPO-AAGN should combined with SCr level and the proportion of global sclerotic glomeruli. Patients with sclerotic MPO-AAGN and an SCr level <4 mg/dl or a global sclerotic glomeruli proportion <60% should be assessed on the basis of each patient’s overall condition and the balance between treatment efficacy and risk, and appropriate immunosuppressive therapy should be prescribed to improve renal function. In this study, patients who received glucocorticoids plus MMF were at lower risk for ESRD compared with those receiving glucocorticoids alone, which was consistent with our findings in previous studies that MMF was more effective than IV-CTX in inducing remission and improving renal function and that MMF could improve long-term renal survival in MPA in Chinese patients (21,26). This result suggests that active treatment can improve renal outcome, although prospective controlled trials with large sample sizes are needed to determine treatment influence on renal survival. Similarly, in mixed AAGN, the proportion of cellular crescents is defined as <50%, which results in variation in the proportions of crescent and sclerotic glomeruli among different patients, affecting the degree of renal function and long-term renal survival. Therefore, in addition to glomerular classification, more accurate acute and chronic renal lesion scores are needed to prompt and guide clinical treatment options. Tubulointerstitial parameters are not included in the AAGN classification, and the influence of renal tubulointerstitial lesions on outcomes is unclear. Berden et al. (1) considered that adding tubulointerstitial parameters increased the complexity of the AAGN classification and had no prognostic value regarding the renal outcome of AAGN. However, several studies (7–9,11) found that renal tubular atrophy, interstitial fibrosis, and interstitial inflammation lesions were related to a poor renal prognosis. In this study, univariate analysis revealed chronic renal tubulointerstitial lesions to be correlated with renal survival; however, this was not supported in the multivariate analysis. Therefore, further studies are needed to address the influences of renal tubulointerstitial lesions on the prognosis of MPO-AAGN. In addition, in this study, hypoalbuminemia was associated with a higher risk for ESRD. Because previous validation studies did not analyze the influence of albumin on the risk for ESRD in AAGN, this finding requires further confirmation. Although our study includes the largest cohort of MPO-AAGN investigated to date, it has several limitations. First, all of the patients included in the study are of Chinese nationality; furthermore, this was a single-center study. Therefore, our results may not be generalized to non-Asians. Second, we did not evaluate differences between MPO-AAGN and PR3-AAGN. Third, the follow-up time was limited, and some of the included patients did not receive intensive immunosuppressive therapy. Therefore, the conclusions of this study require further validation. The AAGN histologic classification in combination with evaluation of SCr and serum albumin levels and treatment regimen is associated with renal outcomes in MPO-AAGN. The evaluation of SCr level and percentage of global sclerotic glomeruli provides additional information on risk of renal survival in the sclerotic class of MPO-AAGN. This study was supported by National Natural Science Foundation of China (No. 81470042) and National Key Technology Research and Development Program (No. 2013BAI09B04 and 2015BAI12B05). The abstract has been submitted to the 18th International Vasculitis and ANCA Workshop (Vasculitis 2017; March 25–28, 2017, Ito International Research Center, The University of Tokyo, Tokyo, Japan).